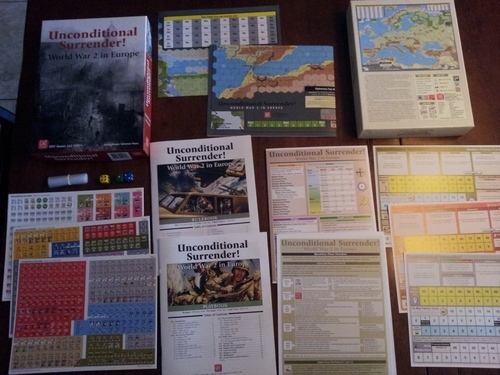 Unconditional Surrender! 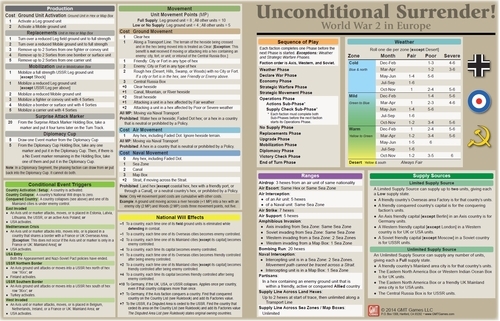 World War 2 in Europe (USE) is a strategic level game covering the World War II European Theater. 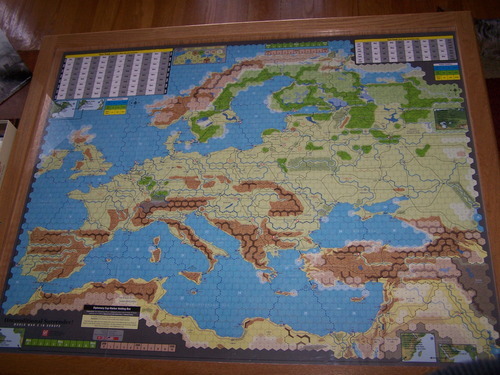 Players make the political decisions and control the military forces of the three major factions that struggled for European dominance and survival. With its emphasis on force projection and decision making, players remain focused on the big picture of managing their front lines and political opportunities. Through simple mechanics and low on-map counter density, players easily handle the strategic action without a myriad of complicated subsystems or tall stacks of counters. As one gamer put it, "It is a delight to be spending my limited brain power on making (or agonizing over) operational decisions that are as dependent upon guts as they are gray matter. This game is not a series of arithmetic exercises, and the only variable in these algorithms is nerve." The game has many scenarios ranging from quick playing individual campaigns to longer ones covering up to the entire war. Low On-Map Counter Density: The number of counters on the map is relatively low. Simple Stacking: No more than one air, ground, convoy, or warship unit per hex. No Factors on Counters: There are no combat or movement factors on counters. Single Combat System: One combat resolution sequence and Combat Results Table covers all types of combat, yet the results differ for air/naval, ground, or strategic combat. Integrated Movement/Combat System: Units move and fight in a combined activation. Historical or Variable Entry: Units and events can enter play using an historical or variable time line. Variable Politics: Most countries’ belligerence and faction alliance is not predetermined. Solitaire Friendly: Though not designed with solitaire rules, the mechanics easily allow one player to play the game. PBEM Capable: The game can be played using PBEM software, but its mechanics require frequent exchanges.